We have been testing a growing number of Clients with our Quantibody Arrays. Many of of these clients have Autoimmune Disorder Diseases. These range from Rheumatoid Arthritis to Multiple Sclerosis. These arrays are designed to precisely measure factors or markers(proteins) that are dysregulated by these diseases. We measure the levels of these biomarkers in our Clients’ Blood serum. The arrays have also been used to measure the levels of markers in plasma and cell culture supernatants. Based on results, we are finding links between immune system and stem cell health. We call this the immunoLink. The link shows that when immune/inflammatory response markers are elevated, markers related to stem cell health are depleted. 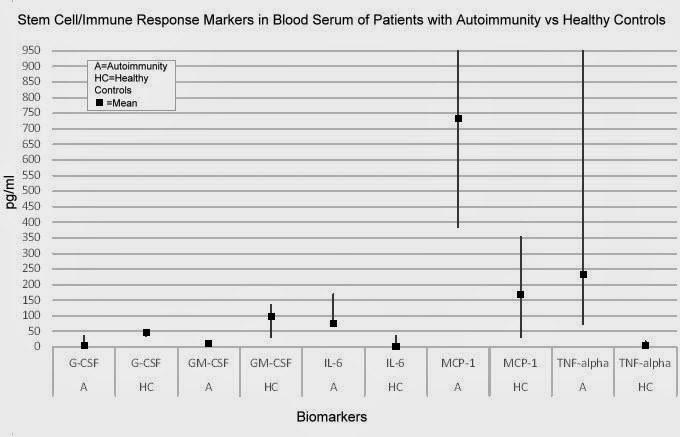 Here we see the immune/inflammatory response markers IL-6, MCP-1 and TNF-alpha are elevated in our Clients with autoimmunity (A) vs Healthy Controls (HC). We also see lower levels of G-CSF and GM-CSF in these Clients. G-CSF and GM-CSF are know to play a role in increasing circulating stem cells. GM-CSF is also know to be secreted by Mesenchymal Stem Cells (hMSCs) AND GM-CSF has anti-apoptotic functions on neurons, and is neuroprotective in animal stroke models while G-CSF has a prominent effect on the differentiation of adult neural stem cells (see: BMC Neuroscience 2007, doi:10.1186/1471-2202-8-88). To us, the immunoLink means achieving a balance between immune system and stem cell health. We provide immune system balancing and stem cell activating therapies for our Autoimmune Disease Clients and Children with Autism. We first do baseline and follow on testing (each 6 months) to determine how well the therapies are working. You can now benefit from one of our first Stem Cell Activating Product named Stem-Kine. Dr. Joe Smarda, an applied immunologist, is user and promoter of Stem-Kine and oh, by the way. He is a European Porsche Cup Champion and pilots our Stem-Kine/Neuromics sponsored race car. Our goal is to bring the many markers we test to healthier levels. As stem cell transplants become more common, moderating levels of immune/inflammatory response in patients could improve outcomes. If you would like to learn more, you can contact me at pshuster@neuromics.com or 612-801-1007.